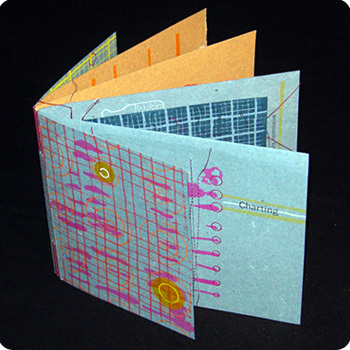 A collaborative edition by Macy Chadwick of In Cahoots Press and Lisa Hasegawa of ilfant press. This limited edition artist’s book was inspired by grids, data and creative conclusions. The edition is based on a one-of-a-kind spontaneous book created by both artists in a collaborative visual dialog that they call One Hour Books. Printed on handmade papers using letterpress and silkscreen with additional elements of drawing, collage and machine stitching. 5.5 x 6.75 inches, closed.